The best type of white tea is Silver Needle. It is a name derived from the basic appearance of the dry tea. The shape is like a needle. And the needles are silvery in color from the fine strands (called “hairs”) covering their exterior. But not all teas labeled “Silver Needle” are created equal. So, it’s time to go exploring. Hubby and I get tea samples with such frequency that recently we have had to start turning them away and saying we were a bit overstocked. But enough come in that we ended up with several versions of Silver Needle. So we decided to select three of them for a bit of exploration. Two were from China (Yunnan province and Fuding county in Fujian province) and one from Sri Lanka (formerly Ceylon). When looking at the dry “needles,” it can be very difficult to tell which tea is which. But rather than make you guess, I’ll tell you. Yunnan Silver Needle – mountain grown and from the part of China that produces pu-erh teas. Ceylon Silver Tips (for some reason, they don’t call it “Silver Needle”) – mountain grown in Sri Lanka and a fairly new offering as this style of tea becomes more popular. Fuding Silver Needle – the original from the Fujian province. For some tea connoisseurs, Silver Needle is only from a certain location, harvested at a certain time of year, and the leaves have certain qualities. 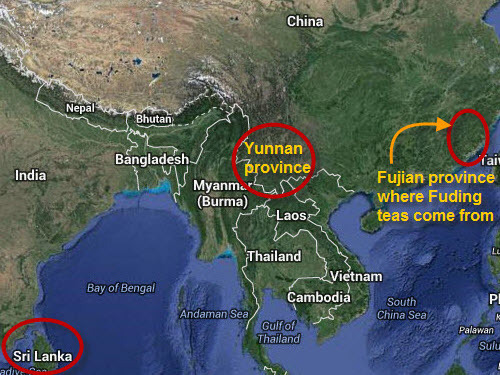 Some say Silver Needle is only the one from Fujian province (#3 shown here). It is supposed to be made from a certain tea plant cultivar (the Da Bai, or Large White, cultivar); this is said to be the genuine white tea and that others are really green teas that just look like this genuine white tea which has special properties for your health…blah blah blah… maybe so, maybe not. Sounds a bit like marketing hype to keep people from accepting other versions of Silver Needle. Of the three teas shown here, #3 is, therefore, the only real Silver Needle. Or so they say. All three steeped in water heated to 180°F for 3 minutes (and we did 3 infusions from the same batch of leaves). Of the three, the Yunnan (#1) proved most satisfying, while #2 and #3 were fairly equal. All had very light aromas, pale liquid, and light flavors. And that is the key to this and other white teas: don’t expect them to blast your tastebuds. They are very light and meant to be sipped and enjoyed, considered to be dessert teas by some. Go exploring and try this very special style of tea! Tea and Cupcakes – a Natural Combo!